Established in 1891 by former governor, US senator, and railroad tycoon Leland Stanford, Stanford University has grown to become one of the most prestigious and well-established research universities in the world. Though it is not considered as a member of the Ivy League, Stanford University ranks continually on-par with Harvard, Yale, Princeton, and other Ivy League members. Over 52 Stanford faculty, alumni, and staff have won the Nobel Prize, including 19 current faculty members. The Stanford University address is in Stanford, California near Palo Alto, 32 kilometers from San Jose, and 60 kilometers from San Francisco. Nestled in northwestern Silicon Valley, Stanford University has established itself as a leading university for computer science studies as well as for innovation. Recently, the acceptance rate at Stanford University has steadily become more selective. For the class of 2017, 38,828 people applied, 2,209 were admitted, and 1,690 students enrolled. This admission rate of 5.7% is currently one of the lowest in the US. Therefore, Stanford University is one of the most selective universities to gain admittance to. Stanford University has some of the most impressive facilities in the country. It has two major student centers that include study rooms, televisions, restaurants, and conference rooms. Moreover, each dorm at Stanford University has a computer lab and every building is equipped with Wi-Fi. However, Stanford is most famous for its impressive athletic facilities. This is because Stanford University athletics is famous for producing Olympic champions and winning varsity sports teams. For example, the Arrillaga Center for Sports and Recreation has over 75,000 square feet for students, staff, and faculty to use. Its fitness room has over 11,000 square feet. The center also has three full basketball courts, a climbing wall, seven squash courts, a fencing center, and a 3,600 square foot room for yoga, taekwondo, and other shoeless sports. There is also the Avery Aquatic Center that has four separate pools and a diving center. Moreover, Stanford University athletics has over 34 varsity sports and Stanford athletes have won over 129 Olympic gold medals. Additionally, Stanford University’s scientific laboratories and research centers are also quite impressive. There is the SLAC National Accelerator Laboratory that specializes in theoretical and experimental research in elementary particle physics and then there is the James H Clark Center for research in engineering and medicine. Additionally, the Stanford library system is quite impressive. It has over 9 million volumes, 1.5 million audio visual materials, 1.5 million e-books, 6 million microfilms, and 75,000 serials. 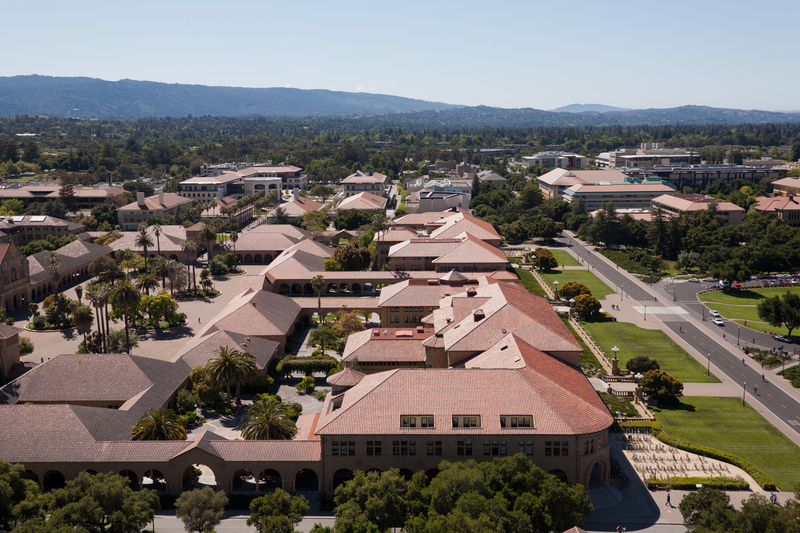 The Stanford University Medical Center specializes in pioneering medical advances. For instance, the Stanford University Medical Center is well-known for its innovations in cardiac care, neuroscience, cancer treatment, organ transplants, and surgery. And lastly, the Stanford University Press has been a well-established publishing house for the university since 1917. Due to its world-renowned editors and writers, the Stanford University Press has won the Bancroft Prize in 1962 and 1992 and the Nautilus book Award in 2010. For all of these amazing facilities and resources at the campus, students have given the infrastructure at Stanford University an A+ rating. Housing at Stanford University has several options. There are standard dorms with 60-200 people who live in single and double rooms and there are also co-ops and self-operated houses. However, students have had vastly different experiences living in the dorms depending on their housing situations. Sometimes three people can be crammed together into one room and the dorm food can be bad whereas other students have lived alone in single rooms and had amazing chefs working in their dormitory. Other students live in fraternities and sororities. Students gave the dormitories at Stanford University an A rating. However, some students complained that their houses weren’t big enough and some of the housing is far from the center of the campus. The cost of room and board is $13,166 per year. Many students emphasized that because their rooms and housing quarters were so cramped that it actually pushed them to socialize and make friends in the common areas and to get more involved with extracurricular activities. There are over 20 club sports as well as great outlets for music, fine art, dance, and theatre. Additionally, there are many community centers and offices where students with similar backgrounds and interests can meet. Most students ranked the student body as outgoing and friendly, though some noted that students tend to stick to their own ethnic groups. Overall, the social life at Stanford University was given a B rating. Stanford University has a reputation as a leading research university and for being among the best universities to study at in the world. There are great facilities and accomplished professors as well as almost every academic subject imaginable to choose from. However, some students disliked that they were not a priority for their advisors or professors because they were undergraduate students and did not get the proper direction they needed. Because there were so many options, many undergraduate students felt lost and uncertain about which academic fields to take and the class sizes were very large. But the overall opinion was that Stanford academics were very impressive and paved the way to later careers. Undergraduate students can take classes in the School of Education, the School of Engineering, the School of Law, the School of Medicine, and the Business School. The most popular majors at Stanford University currently are library science, multi/interdisciplinary studies, engineering, biological and bio medical sciences, computer science, and the physical sciences. Stanford academics were given an A+ rating. As at other prestigious universities and programs, Stanford University tuition does not come cheap. Stanford University tuition is $42,690, room and board is $13,166, books and supplies are an average of $1,500, personal expenses on average are $2,400, the orientation fee for first-time students is $438, and the campus health services fee is $555. The total Stanford University tuition is $60,749 per year to study at Stanford not even including individual travel expenses. 72% of students receive financial aid and over 60% of this aid comes from grants and 13% are loans. The average amount of grant money that students got was $34,497 and the average loans that students took out were $5,944 per year. However, the percentage of students who received financial aid was 82%, with need-based aid accounting for 52%. Due to all this help, only 25% of Stanford students graduate with debt. Students made up for the remainder of these expenses by either taking out more loans or by finding Stanford University jobs. Many of these Stanford University jobs are federal work study jobs. Unlike other types of Stanford University jobs, these federal jobs are paid by the Department of Education and not by the individual employer. Only students who are US citizens and on financial aid are eligible for these federal work study jobs. However, for any other Stanford University jobs, students can find them on the Cardinal Careers Center to get other on-campus jobs. Overall, students enjoyed studying at Stanford. The drawbacks were the focus on graduate students and sheer enormity of the university. But Stanford University has earned a B+ rating for its entire college experience. – Ken Kesey began writing One Flew Over the Cuckoo’s Nest while studying at Stanford.